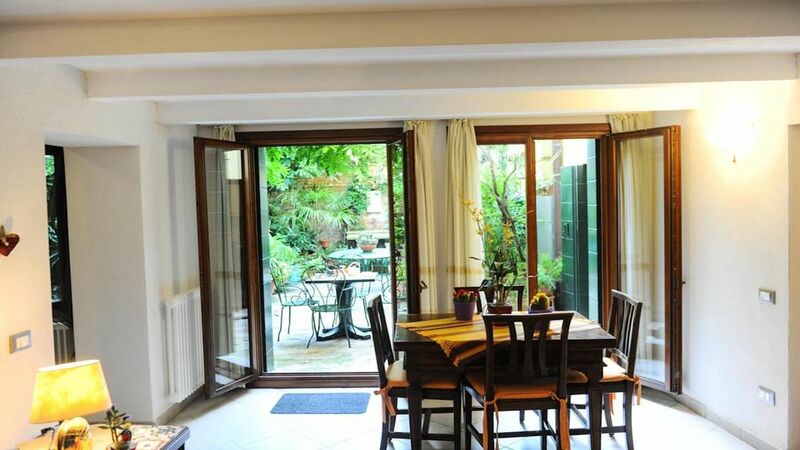 Wonderful apartment with all the amenities plus a lovely garden setting. Walking distance to many key sights, restaurants, shops ... and very close to the Vaporetto/water bus. The Morisini's are cordial & friendly hosts! Thank you so much for everything and i do hope to have you again as my guest in the future. Ciao. I loved this apartment and its wonderful garden. It is lovely and spacious in a quiet part of Venice yet it's within walkable distance from the train and autobus stations and the vaporetti. The apartment has modern decor, is well furnished, clean, and comfortable. The rooms are well-proportioned, the large bedroom has plenty of cupboard space and the living room looks directly out to the garden. The kitchen is well equipped, with everything you need to cook and to feel at home. The garden is a welcoming oasis of peace; it is a wonderful place to drink the morning coffee and plan the day ahead, or to relax with an evening glass of vino. A supermarket and reasonably priced restaurants are just 2 minutes walk away and all the tourist highlights beyond the Rialto are only 20 minutes walk. I've no hestitation in recommending this apartment. Thanks again to Mara, Loisella and Alberto for a wonderful time.